Yep, it’s a long weekend in Canada. Now that I’m recently retired it has a bit less impact, but fun just the same. The holiday is actually Queen Victoria Day, which we used to call “fire-cracker day” when I was a kid because we got to light off fireworks and fire-crackers in the backyard. I still have a faint scar on one of my fingers from a fire-cracker gone bad! It’s a holiday that’s been around for a long time, starting back in 1854 on Queen Victoria’s 35th birthday and before the Confederation of Canada. Not planning any fireworks in the backyard but I’ll work on my bark carving on and off through the weekend. The cabin is coming along with the roof pretty much completed. 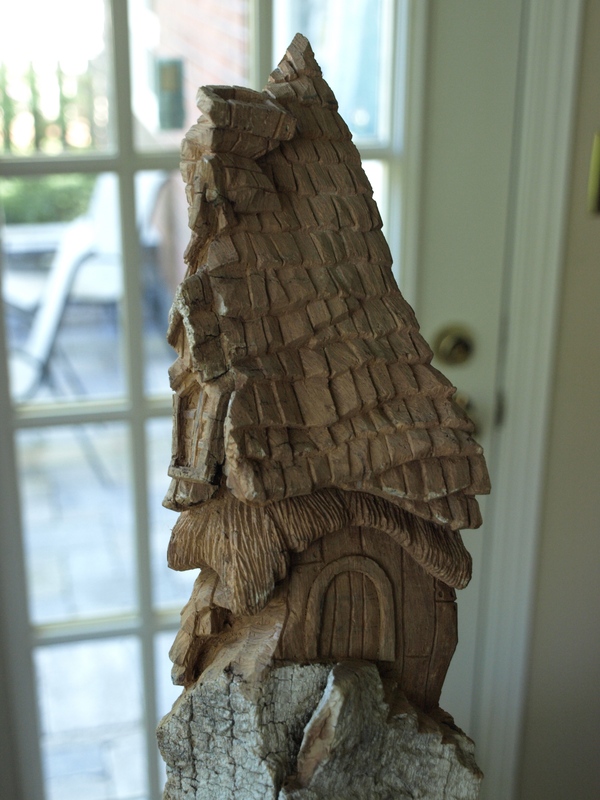 I chose to combine some shingles with a couple sections of thatched roofing. It’s looking pretty good. I’ll need to get my thinking cap on to complete the rest, but I’m picturing some wood structures, some large stone block work and at least one large tree trunk. We’ll see what turns up. Yep, May 1st was the official date. I’m still getting used to the idea but I’m certainly not tired of it yet! You’re right on the money in “letting your imagination run wild” as I’m just adding things as I go on this carving. Hadn’t thought of a Basset Hound, though…but, I’m not finished yet! Mark. It’s a beautiful piece Mark,it must be fun adding things as you go along. It is fun, Lynne. 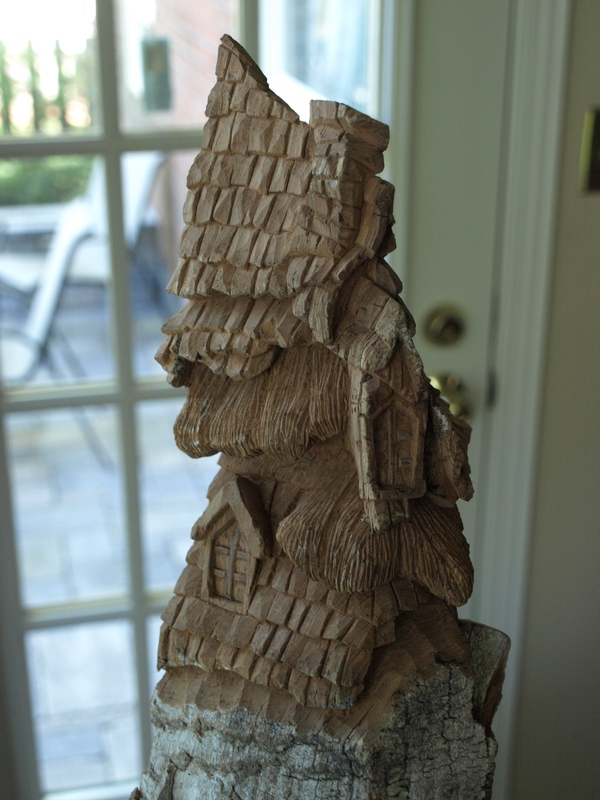 I spoke with Emily today on the phone and told her to make room for another bark carving. It looks great!! I have plenty of room next to Cottonwood Castle!